IPM methods equip pest control operators and other members of the IPM team to design flexible, site-specific pest management plans scaled to the severity of the problems and the level of resources available. Use of Integrated Pest Management (IPM) principles and practices in the school environment is a growing trend in communities throughout the United States. IPM's focus on pest prevention using effective, least-toxic methods is proving practical to apply and cost-effective to operate. EPA promotes integrated pest management through documents such as the IPM for Schools: A How-to Manual, because IPM represents a prudent approach to understanding and dealing with environmental concerns. Because IPM is a decision-making process and not a rote method, an IPM program will always be able to take into account the wide spectrum of pest problems and the diversity of people involved. IPM for Schools: A How-to Manual is available in Adobe Portable Document Format (PDF). Chapters 1 through 4 provide a full discussion of IPM concepts pertaining to schools. These chapters will be of particular interest to school board members, administrators, principals, facility managers, and parents as they work to establish IPM policies, pest control contract guidelines, and other administrative systems designed to institutionalize IPM. Appendix B, "How To Develop An IPM Program," provides a step-by-step guide for implementing a school IPM program, and includes a discussion of the psychological and institutional barriers to IPM. Chapters 5 through 19 cover IPM strategies for 14 of the most common pests or problem sites in U.S. schools. These chapters are written primarily for pest control personnel and others who may be involved in the day-to-day pest management in a school. Mention of trade names, products, or services does not convey, and should not be interpreted as conveying, official EPA approval, endorsement, or recommendation. Positioning the aerosol directly in front of the target can reduce the chemicals used by up to 90%. 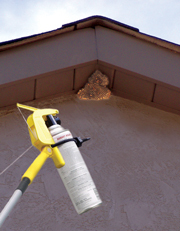 20ft sprays could reach the nest, but they would also saturate the side of the house and use up to 90% more spray. Many sprays are petroleum based and can damage siding, shingles, and surrounding greenery.